What Facebook Lead Ads Triggers and Actions are Supported? Admin/owner permissions - You need to be a Page Admin for the page you are collecting leads for, and if you are using Facebook Business Manager to manage your Ad account, your setup must be as either an Ad account advertiser or Ad account admin in Facebook Business Manager for your Ad account. 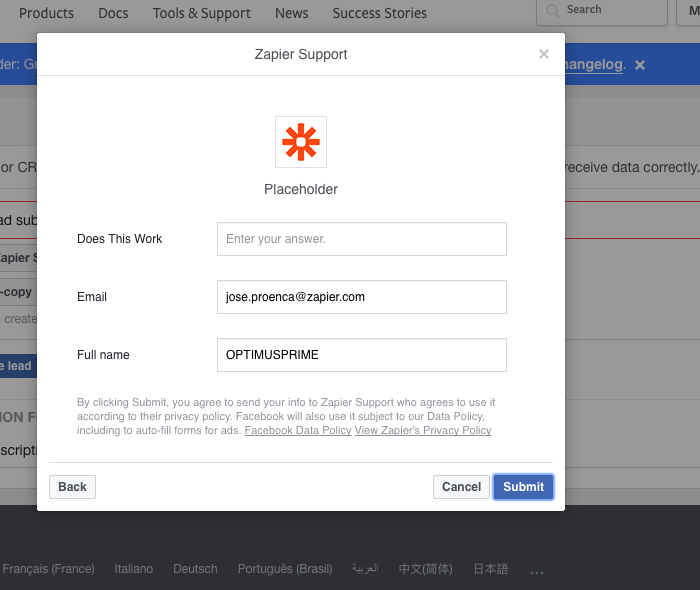 You may also need to give CRM permission to Zapier by adding it to your Facebook page - more on how to do that here. To get started, connect your Facebook Lead Ads account to Zapier. With your account connected, click "Continue" in order to select the Facebook Page and Form (Lead Ad) to involve in this Zap. 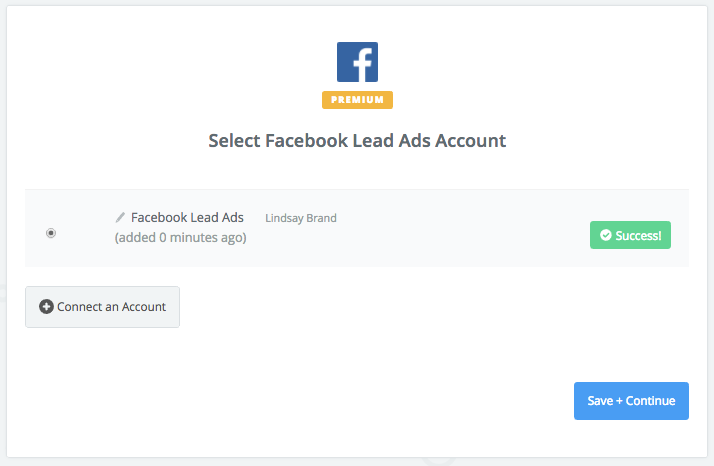 If all steps were successful your Facebook Lead Ads account will now be successfully connected. Tip: During your Zap's trigger test stage we'll get some fake dummy data from Facebook. If you want to get a real sample to better map our your Action template with, during your test steps follow this guide to submit a test lead from Facebook. You may need to test Facebook Lead Ads, and you want to use a sample contact other than Facebook would pick up from your login. You can do that using the Facebook Lead Ads Testing Tool. Reconnect Facebook Lead Ads again here: https://zapier.com/app/settings/authorizations and this will refresh your settings to allow Zapier access to your leads. If you have checked all of the above and your Zap is still not being triggered despite receiving new leads in Facebook Lead Ads, please contact us, so we can take a look for you! NOTE: If you've already used this tool to send a lead you'll have to delete that lead before you can submit another one. Permissions for Facebook Lead Ads in Business Manager are assigned to your personal Facebook account. 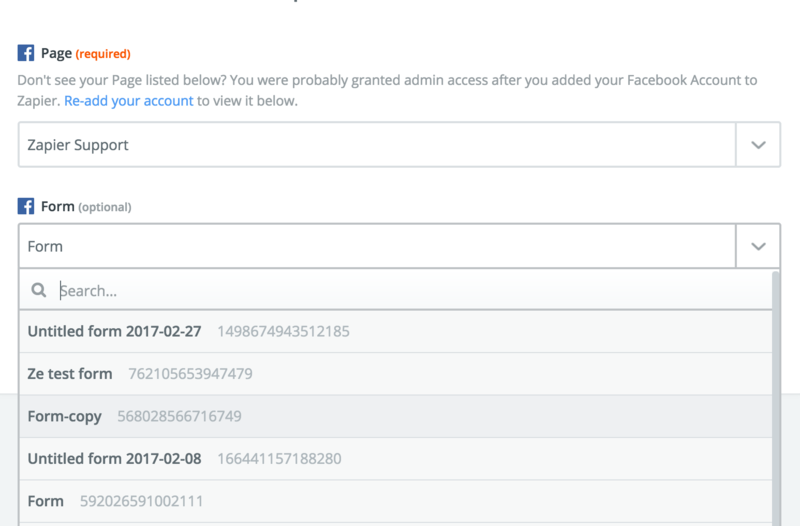 Any Pages/Ad Accounts that you've been assigned to in Business Manager are available when you connect your personal Facebook account. If you run into this error when trying to test your Facebook Lead Ads Zap, it could be that your linked Facebook account is not an Admin of the page you selected. Your account needs to be an Admin of the page to be able to use this integration. You can check to see if your account is an Admin by opening your Facebook page settings and navigating to "Page Roles". If you are getting this error and you are an Admin of the page, please contact us, so we can take a look! If you're seeing this error, it's likely because you changed your password in Facebook. You'll need to reconnect your account. You can do that by going to the Connected Accounts page and clicking the reconnect button next to Facebook Lead Ads, then typing in your credentials. This is caused by the trigger being sent from the Facebook testing tool. It was not an organic lead. When you map that field, you can expect it to work once the Zap is running on real data. There are a couple of things you can do if you run into this. Zapier will not be able to see leads that were created before your Zap was turned On; we can only trigger off of leads that have been newly added to the Trigger app. One workaround to import leads that were created prior to the Zap being turned On is to follow these instructions to download your Facebook leads as a comma-separated values file (CSV file). With a CSV file in-hand, you can semi-manually copy records into a Google Spreadsheet to trigger a Google Spreadsheet Zap. Be wary of rate limits. You can check out this guide for more information on how to do this. In July 2018, Facebook made a change in their site, which requires all users to acknowledge/approve their Terms of Service before creating any new custom audiences. This will only need to be performed once for your Facebook Leads account. If you're trying to get the most recent lead to come through (perhaps because it has a new field you need to use), make sure that you have a specific form selected in the trigger options. If you don't have a form selected here, Zapier will retrieve samples from oldest to newest. When you select a form, however, the samples will be retrieved from newest to oldest, so you'll be able to use the most recent leads. At the moment, there may be some cached permission issues that we need to resolve with an update to our application. In the meantime, if you cannot find a Page you have adequate permissions for, you may wish to fully disconnect Zapier from your Lead Ads account, and then re-add it. Keep in mind that this will effect all of your Zaps using this user's account. If you have more than one Zapier account or other people using a shared login, you may wish to notify them before you do so.